The Hours - My Memoir: Living Root Bridges! Shillong to Cherapunji is a nice 2 hour drive. Our resort owner made it sound even simpler. He asked us to go to the taxi stand in Mawlang, near Anjali cinemas; take a shared taxi for Rs50 per person till Cherapunji (Sohra). At Sohra market, hire a taxi for Rs350 till the resort (Cherapunji Holiday resort) which is 18kms away from Sohra, in a village called Laitkynsew. But as told, there were no taxi at Mawlang on the day of Christmas. There was one to Guwahati but none to where we wanted to go. Thankfully the taxi driver waited till we checked. So we booked the same taxi till the resort for Rs1400, which is the standard rate; as already informed to us by the resort owner. The drive to Sohra was nice with great view of the valley. Cherapunji holiday resort is built overlooking the hills and the Laitkynsew village below. The main building has a dining hall surrounded by few rooms and a kitchen. The rooms are priced around Rs2000. Accommodation recently built is priced around Rs3000. A raised area has four to five tents if one may choose to stay in them. The resort is owned by a gentleman named Mr Rayen who hails from Madurai. Family pictures hung in his main office tells the story of his marriage to a Meghalayan resident and their parenting of two boys and a girl. He informed me of the treks we could do to different living root bridges and handed me a big file with details of the same and some Khasi language guide. The cooks and servers are localities and are very gentle and kind. But one must not expect great north Indian cuisine here, especially the Baingan Barthan that we tried was not even close to the original recipe. But they make descent parathans and French toasts. Next morning, we were ready to leave by 8:00AM. Our guide, Phedrison Sohkalet (Fedri) is an 18 year old boy studying in his first year of BA. He lives with his sister in Shillong while attending his college there and was home for vacation. We planned to do the Double Decker, which is a 10 Kms trek one way ,5kms of which is on a paved road till village Tyrna. Just as we walked out of the gate, One of the village taxi passed by and they stopped for Fedri. He dropped us till Mawshmok. At Mawshmok, the road divides to go to Sohra and Tyrna. We walked to Tyrna village. On our way, I took some Khasi language tuition from Fedri. “Kublie” is used to greet one another and it means – God bless you. I enjoyed learning the language. At Tyrna the road ends and a flight of 3000 steps run down till the village of Nongthymmai and passes through the Umsophie village. Believe me, the steps are really steep and will definitely result in serious muscle catch once you are back. So take care! 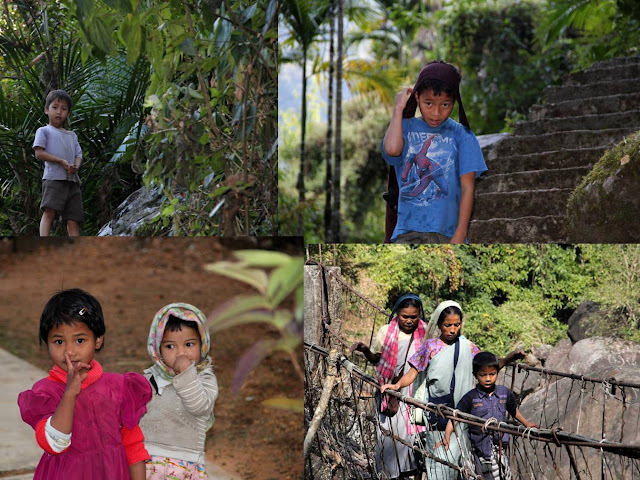 After gliding down the steps and crossing three steel cable bridges, one reaches the village of Nongriat. Here one needs to pay Rs 30 for entree. I did ask Fedri if the money would be spent on village development activities. But he just smiled suggesting something fishy in the process. We paid the lady Rs 50 and bought some oranges that she carried. Every house here has at least one orange tree and the oranges are as sweet as honey with a tinge of sourness. A resthouse at Nongriat would be a less expensive option to stay if you are looking for an economic trip. But, this place has very basic amenities. They offer rooms for Rs 400. Their contact number - 8575913994 or 961737690. After almost four hours of trek we reached the living root bridges. The Umshiang Double Decker welcomed us with its wide spread roots that seemed to have parted at the top and entangled at the base, very naturally without any human intervention. But in reality, the villagers have routed the main and secondary roots of this Ficus elastica tree (Indian rubber tree) to the other bank using the barks of a beetle nut tree. A piece of art this was! Perhaps this is one of the rarest occasions where man has worked with nature without disturbing it. However one may find that the place is now getting a little commercial, with some shops, entree tickets; crossovers built of concrete, very next to the living bridge. Though I first felt bad and skeptical about this, I later realized it to be more selfish as a traveler to expect the villagers not to find comfort while we live in cities with all the luxury we may desire. 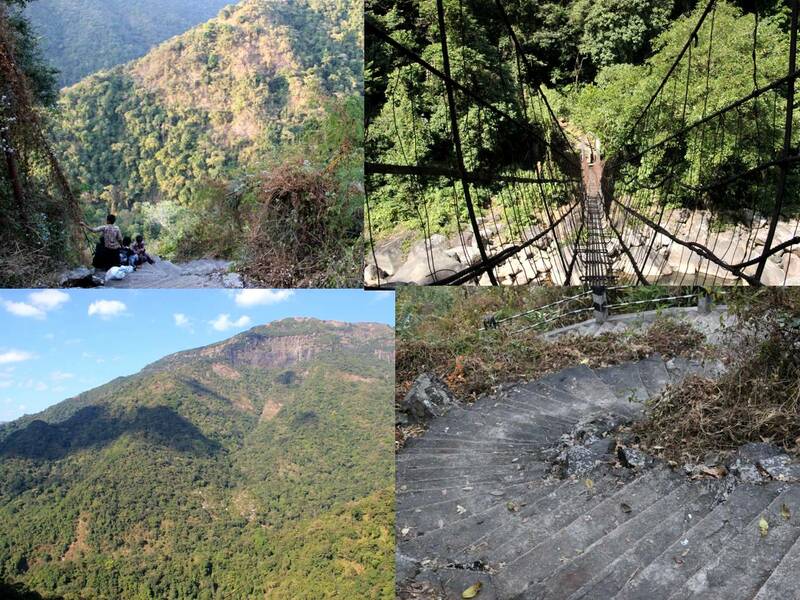 What is more important is that the villagers are preserving the root bridges and are also building more around the area though they would prefer the steel cable bridges which are more robust and faster to build. 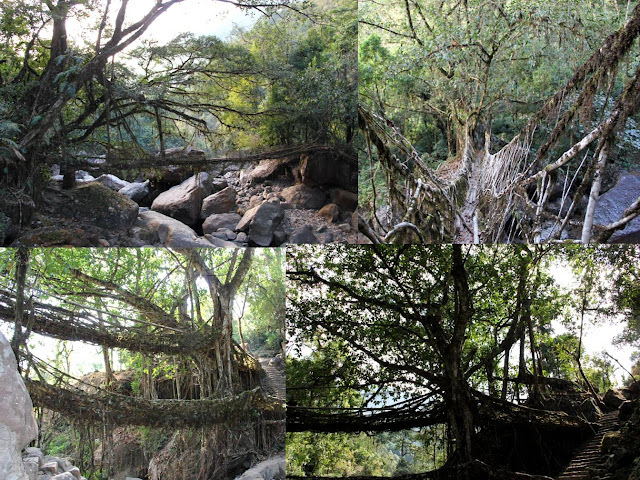 I am thankful to the team responsible for the BBC Human planets series on River that captured the Living root bridges and made me aware of this beautiful creation. The root bridges were dry during winter. If you want to see them green one needs to trek in between August and October. But it rains heavily till end of August making the steps slippery and even more harder to descend. 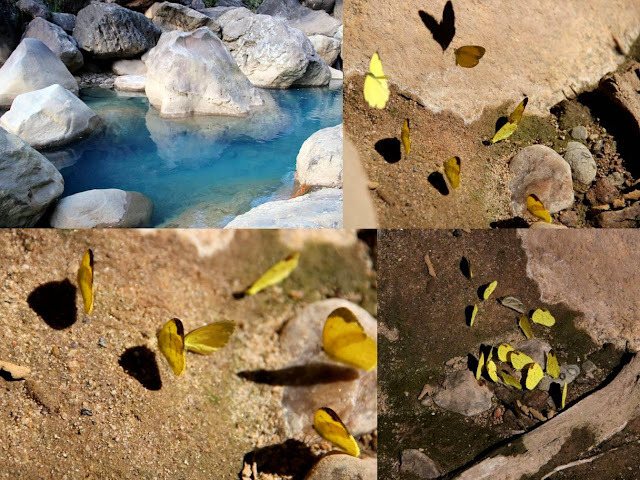 Another 2km walk into the forest leads to a natural swimming pool with clean blue water surrounded by rocks. I found a group of butterflies in a small cave like formation. After having our packed food and some play in the water we headed back. On our way we met travelers from Bangalore, Kolkata and Germany. While returning a thought occurred to me. One can never see a place in its completeness. If one visits here during the Monsoon, one may see the root bridges green with ferns alive but one also misses the plunge into the natural swimming pool and the treat of winter- the oranges. Hence, one can never see any place completely; not even by living there for an year as even time brings several changes. At Nongthymmai is the longest root bridge. We bought a fruit called Soh pyishong at a house here. At Tyrna we stopped for some much needed tea. People here drink tea with Shera, which is nothing but roasted flattened rice (Poha). I also tried a poori like snack called Atta. At Tyrna, a jeep from the resort came to drive us back. It was 4:45 PM when we reached the resort. The trek was amazing and our guide Fedri was an interesting person. Fedri, who listens to English and Khasi music is a big fan of West life band and movies like Transformers. He speaks descent English. When asked what he would want to be after his studies, he answered that he would be anything that he wants to be then. That sounded like a perfect answer. It is interesting that the villagers need to walk up and down these 3000 steps and 10km drive to get rice and other amenities. Life is very simple here. They sell beetle leaves, beetle nuts, a spice called Dalchini and the grass used to make broom sticks. At 5:00 PM when it gets dark, they spend time talking to neighbors or family. Seeing them, I felt that life is complicated only when we make it. The generosity and kindness of the northeast Indians always touches me. If I was there with you now- you would hear me giving you and standing ovation for this piece!!! I cannot begin to describe to you the joy I had reading of your excursion...and SEEING the pictures- especially of the root bridge- fascinating beyond belief. Really a wonderful post and well worth the wait!!! I read this and the earlier post and remembered about my recent short visit to Assam and Meghalaya about which I have a couple of posts. You are so right, it is difficult to completely experience a place unless one actually stays there. 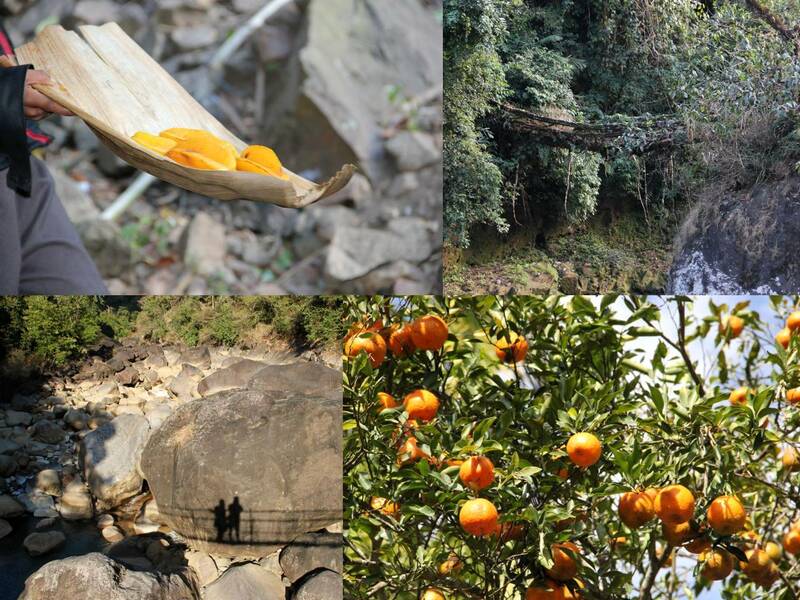 The North-East is a hidden treasure of India and one needs several visits to understand and identify with the place. Waiting to read more! Oh boy! After looking at your pictures I want to drop everything and just run there! Even though I may get a tiny slice of one season. Beautiful pics and fantastic write up......need not visit the place!! do you want to say one can stay at a resthouse at Nongriat instead of cherrapunjee ? how long it takes to go to that place ? for double decker bridge do you think one should stay at Laitkynsew or one can come from cherrapujee also ? Nongriat is very close to the bridges and is within 30 minutes of a walk. This is the only option other than the resort (Which is at Laitkynsew) From Chera it will be 18Km to here plus 4-5 hours of trek one way. The rest house is the best option if you are not traveling with family. because thy have very basic amenities. Please email me if you want to know more.